A surprising discovery was made in Jaffa during the construction of the Uri Geller museum. As electricians were rewiring the ancient building which will house the museum, a large chamber was uncovered dating to the Ottoman period. Uri Geller, for whom the museum is named, felt intuitively that there was something hidden underneath the rubble within the chamber. 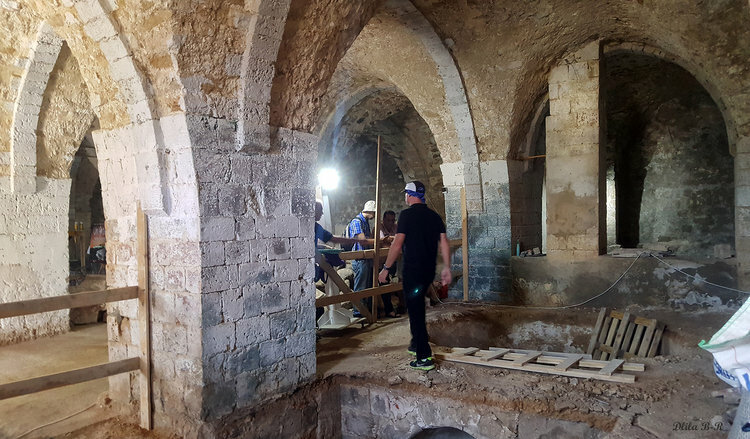 Together with the Israeli Antiquities Authority (IAA), who are overseeing the project, Geller cleared the rubble and revealed an Ottoman masbena, or soap factory. According to Dr. Yoav Arbel, a Jaffa expert with the IAA, this is the second masbena discovered in Jaffa. The first, the Damiani Family Masbena, operated in a large vault beneath the Jaffa Museum until 1948. 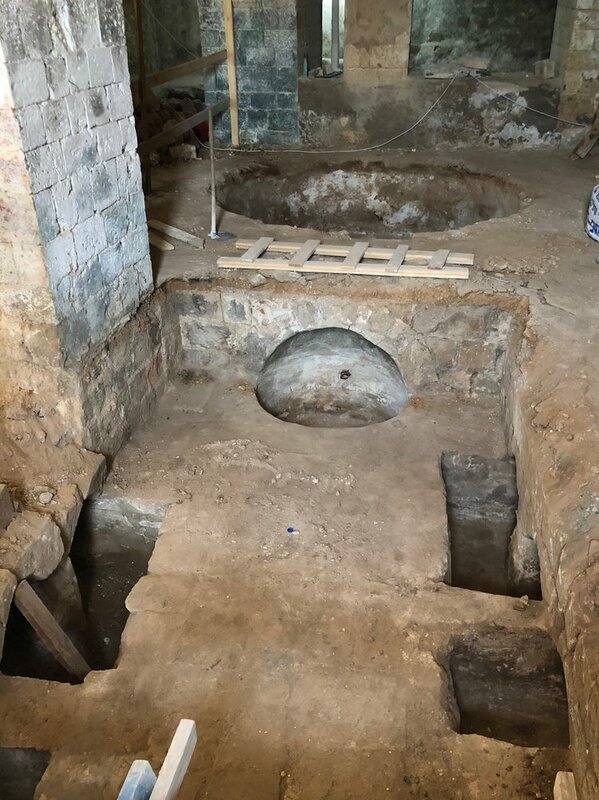 Although we don’t know the family name of who owned this second masbena, Dr. Arbel says it “was well preserved and included troughs for mixing raw materials for the soap, a large cauldron, a hearth, water cisterns and underground vaults that were used for storage.” Several utensils were also found including a shovel, a strainer, a wooden mallet, and even a shoe which must have belonged to one of the workers. The equipment from the two factories are nearly identical. 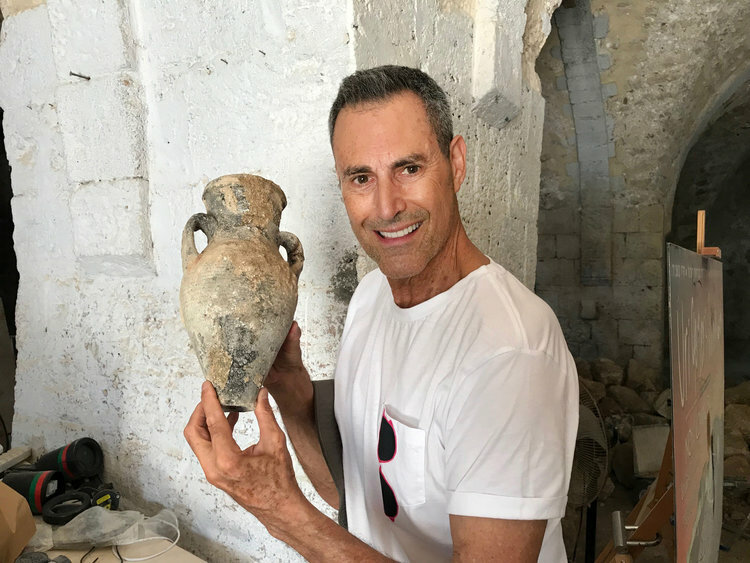 Uri Geller holds a water or oil jug that was discovered during the work in the museum. Since the Middle Ages soap making has been a lucrative trade in the land of Israel. As early as the 10th century, production centers such as Jaffa, Nablus, Gaza, Lod, and Jerusalem were producing soap on an industrial scale. While some of this soap was sold locally, a large portion of it was exported throughout the Ottoman Empire, especially to Egypt. Why was soap such a commercial success for the land of Israel during the Ottoman Era? Largely, because of one of Israel’s greatest commodities – olives. European soaps at the time used pig fat as a base, a substance which is unclean to both Jews and Muslims. The soap that would have been manufactured in Jaffa, however, used olive oil as the base ingredient. Soap-makers would mix the oil with water, lime, and soda ash derived from saltwort plants. The mixture would then simmer in large vats for seven to ten days, after which it would be poured onto lime-covered surfaces where it cooled for another ten days. The soap was then cut into bars, embossed with a factory seal, and stacked to dry for about two more months. Finally, the bars were wrapped in paper and sold. Olive oil soap was not just for the Middle Ages! This newly discovered masbena in Jaffa, Dr. Arbel says, “allows us to reconstruct the manufacturing process, and to draw comparisons with similar factories where the traditional manufacturing process has been perpetuated to this very day.” An example of this are two factories in Nablus which still manufacture soap in a traditional fashion. While the Damiani Family Masbena is no longer open to the public, visitors will be able to see the Uri Geller Museum masbena and its utensils once the museum is complete. The museum will have not only soap-making utensils, but also a variety of items which Geller plans to display including a Cadillac covered in about 2000 spoons belonging to famous persons and the “World’s Biggest Spoon,” measuring 18 meters in length weighing 6 tons!